“By creating a series of short films we acknowledge the history of the space and tell stories that keep it forever. The Listeners Project have just completed working on their fourth project this time at the Farmiloe Building in Farringdon. Since 1886 glass, paint, lead and brass have been manufactured here and more recently the building has served as location for ‘Batman’, ‘Inception’, ‘Eastern Promises’ and now The Listeners Project. Directors were randomly assigned a floor of the soon to be refurbished Building. Following four consecutive days filming, and a little over a week to edit, the films were then screened at the same location on October 15th 2015, to an audience of over hundred. Back once again with the listening walls, this time in the Farmiloe Building in Farringdon, London; this marks the 3rd Listeners Project completed in 2015. 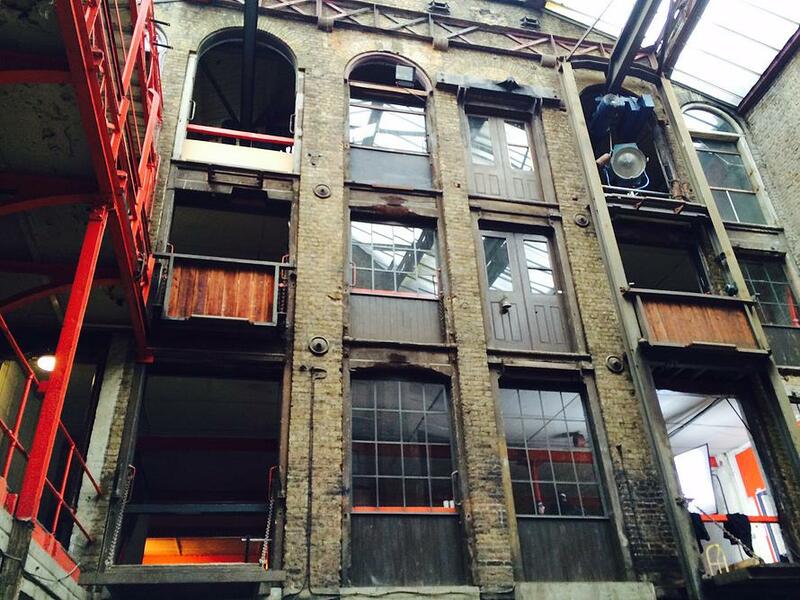 The first of our Farmiloe films is set in an abandoned building (who’d have thunk it? ), written and directed by Ben Lambert this is an interesting snapshot of a moment in the journey of two men who are in each other’s lives for what reason, we’ll never know, but the point is not to know what’s happening, the short draws you into a world and teases the audience with what they don’t know. I am of the mind that with these shorts, the most successful ones are the ones that speak the least dialogue, but say so much more than some of the conversation heavy ones. It’s all in the unsaid. I was engaged throughout and loved the dialogue and the shots. The two actors, Andrew Obney and Shane Cameron seemed rooted in the world and Obney conveyed a world-weariness that had seen too much and as tired of it all. The second outing in the Farmiloe project written and directed by Jamie Sims plays with the perceptions of the characters and the things we do to each other. Very clever and underpinned with a driving tune that builds nicely. Great use of space. Written and directed by Phil Fisk, this film is beautifully shot but I’m not entirely sure what the point is. It is subjective, but I think it may be about monotony and monotony broken, along with humankind’s relationship to food. 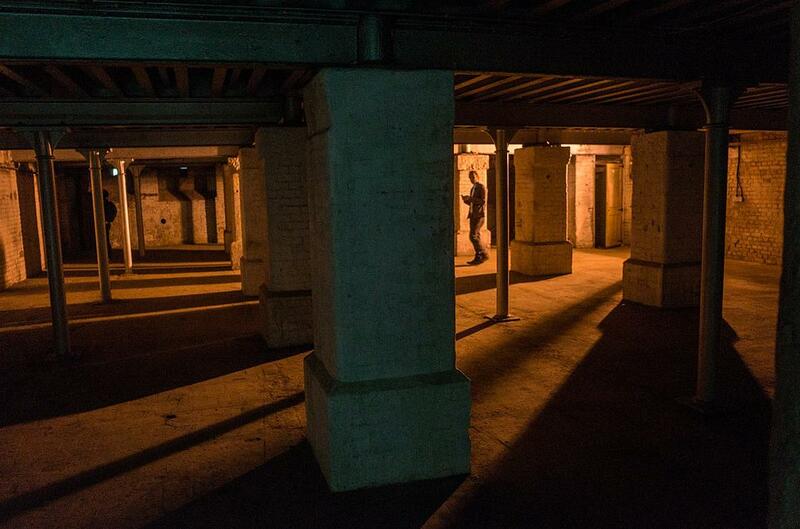 Chris Fairly plays a weary security guard, trudging through his routine of rounds through an empty warehouse. “A fur-coated Norse demi-god is one day delivered to an empty storage facility”. This seems to be the most ambitious piece so far, bringing to mind Jodorowsky with a touch of Greenaway; the surreal and the poetic. The framing of the shots and the use of light shows an understanding of cinematic aesthetic that is both beautiful and stark. (That sentence was for the Sight and Sound crowd). I enjoyed this film massively, it brings to mind Ben Wheatley’s A Field in England, which was as enjoyable as it was different, and the directors here manage to achieve something quite extraordinary in a mere 10 minutes. Massive props to all involved. That was the four films but sneakily the Listeners decided to step up their game and as an easter egg they also give the challenge to four spoken word poets to interpret the spaces in their own way. They are all brilliant (and short). Well done to all involved. This is an exciting project that deserves to be seen. Thanks brother! Reading this one from my single mattress in Haiti!!! Glad you like it. Inspired.